Road humps (sleeping policemen) and 'speed visor' technology. The contents of this webpage have been endorsed by a research academic at a UK university. Further examples are sought of compensation having been obtained from local councils as a result of damage to cars from badly designed road humps. This webpage is largely 'historical in that it shows events at around 2004/2005, not as they necessarily still are in 2015/16. Many links from the earlier age may now be broken. Preamble from the early days of this website - when I was much involved with local government. If you are interested in the crass stupidity and wholesale waste of public money by 'jobsworth' local council officials and inept councillors, then please do persevere and read all of this webpage and some of the other websites devoted to road humps. You may not be technically minded, and you may not be particularly interested in road humps, but wanton waste of public money should be of concern to every citizen in what still passes for a free country - as should a multilayered system of local government that is as wasteful and self-serving as it is inefficient and arrogant. Of particular regard here is the Great Wyrley website.The Bromley website (see link below also) contains a well written summary of the problems of various types of road humps. There is however a wider issue - the gross disregard for the views of the public, many of whom in towns such as Sidmouth are far better educated than are the majority of councillors. This represents a degradation of local democracy at a time when central government is trying to preach local accountability and devolution of power. In addition, the various inept and sometimes arguably corrupt planning decisions of local town councils (more on Sidmouth Town Council later) should call into question the whole competence and fitness for purpose of local government as it is presently operated in the UK. A key point is that the solution is largely in the public's hands. In Sidmouth it is well known (and enshrined into local folklore) that a half empty yoghurt pot would be elected if it received the endorsement of the local Tory MP. If voters are so disinterested as to continue to elect the same inadequate people year after year (and if no intelligent people bother to stand for election against them) then matters can only get worse as various power bases and friendships between officials, 'favoured' local contractors and long-serving councillors are further consolidated. Political note added September 2016: The last paragraph above, first published in 2004, proved prescient - various unpopular decisions by East Devon District Council led a decade later to the formation of the East Devon Alliance of independent district councillors and to the Save Our Sidmouth group at about the same time. Most of the 'old guard' of Sidmouth Town Councillors lost their seats. Both the EDA and the SOS group have their separate websites, as does Councillor Claire Wright from Ottery St Mary who stood as an MP - she received much local support but was not able to unseat the local Tory Hugh Swire. In 2016 Hugo was made 'Sir' Hugh but no-one locally seems to know what he ever did to deserve it apart from being a crony of the ex-PM David Cameron. He lost his ministerial post in Theresa May's first reshuffle. Despite having to exist on a diminished salary and expenses package of maybe less than £100,000 pa, the diminutive figure of Hugo can still be seen occasionally shopping at Waitrose in Sidmouth in his environmentally friendly Range Rover Sport, sometimes accompanied by his allegedly bossy little wife - daughter of Sir John Nott. Examples of road humps and their problems in Cirencester, Honiton and Sidmouth are discussed below. Road humps and Speed Visors: Examples of failed traffic calming. The important point is that hundreds of thousands of pounds of public money has been poured into road hump schemes but seemingly with no proper design guidance being utilised: many schemes appear to be the result of no more than a local 'try it and see' initiative by councillors whose decision making processes appear to be limited to picking options either by random or with an eye to what might be in tune with local opinion at the time. Over the country as a whole, probably millions of pounds continue to be wasted in similar duplicated failures. Speed Visor technology is being widely deployed in the UK but with limited effectiveness. A new webpage containing these details will be published shortly. Locally in Sidmouth, grandiose claims have been made for the effectiveness of flashing speed signs by both officials and councillors of Devon County Council. More details, together with the results of a proper traffic speed survey will be published later. In claiming that the flashing 20 mph sign along the A3052 road in Sidford had caused 80% of vehicles to obey the new speed limit, Devon County Council appear to have taken into account the speed of all vehicles passing the sign - including those stuck in the many traffic queues that crawl along the road at less than walking pace! In reality, the speed of over 80% of traffic in 'free flow' conditions continues to be above 20mph - and with most being over 30 mph, as it was before the speed visor sign was installed. If road traffic 'experts' bothered to find out what has been proven so successful in other countries (or even elsewhere in the UK) they might stop wasting so much of your money. It is possible to slow down traffic without using road humps that inconvenience all motorists. One option is to deploy the Spanish Solution (also apparently used to good effect in Portugal). Another solution would be to remove from the roads the 10% of inconsiderate and/or idiotic drivers who cause 90% of the problems and probably 50% of the accidents. This could be done with proper legislation and effective police patrols - but politicians are unwilling to be deflected from the revenue generating 'speed camera' culture despite that there is increasing evidence that this is simply not working - more on this later. Locally around Sidmouth, as if the village of Sidford had not suffered enough with Councillor Stuart Hughes and his traffic signals, speed humps were installed several years ago on a little used road - again courtesy of Devon County Council at the behest of Stuart 'lunatic' Hughes. 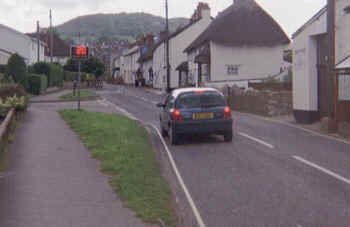 More recently, in late 2007, other road humps in Sidmouth were reported to be 'amongst the top ten worst in Britain'. 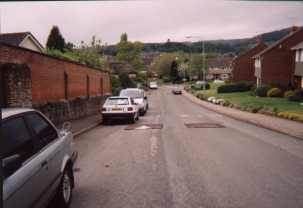 This followed consultation with the SeeRed website by a firm of consultants working for Continental tyres and although the selection process for deciding on which were the 'top ten worst sets of humps' may well have been somewhat shallow, selection of the Manstone humps has served to ignite local discussion. As might be expected, councillors can change their views depending on which way the wind is blowing (by way of perceived public opinion) and the whole saga of road hump installation serves as a good example of the paucity of intellect that runs through local government. Further discussion of this may be found below, where the Manstone humps are discussed. More generally, road humps have been blamed for increasing noise and pollution and for the much increased use of 4x4 vehicles in urban traffic. Some areas have a lot of humps, others few if any. Is there any authoritative design guidance that takes into account how drivers actually behave? In Sidmouth as elsewhere, the authorities fail to realise that some of the worst speeding offenders are people driving old cars of low value (and who do not care if their cars are damaged) and drivers of company maintained vehicles who again have little interest in whether they are causing damage to suspension systems. Some older drivers with arthritis or painful hip joints find traffic calming humps very uncomfortable, even at very low speed. Elderly bus passengers can be worst affected - they can hardly expect drivers to slow down to a crawl! One bus company has highlighted the concerns on its website www.bartonbuses.co.uk/company/hump.html . One recommended 'protest' site is www.greatwyrley.org.uk. The sustained and spectacularly arrogant attitude of Staffordshire County Council is highlighted. 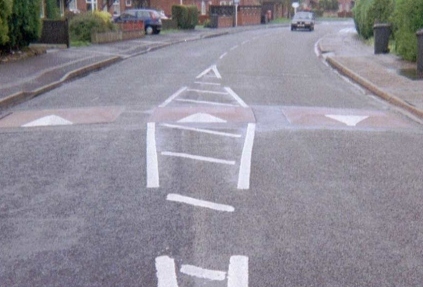 They apparently installed 145 road humps in the village of Great Wyrley in Staffordshire at a cost of £250,000. More details are on the website. Staffordshire County Council is apparently paying out compensation to irate residents who have had their cars damaged by humps. Is this a sensible use of public money? A good summary of the case against road humps is provided by the Bromley Action Group here. 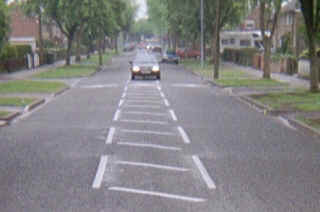 One site that gives a range of costs for traffic calming measures is www.homezones.org/measures.html using data supplied by Hertfordshire County Council. This site appears well written and worth reading. However, it is out of date by several years in places! Some postings on the 'honestjohn' motoring website suggest that humps devalue a neighbourhood because they are so often used in 'downmarket' areas where joyriding youngsters are a particular problem. It is now regularly suggested that road humps stigmatise the road or estate which they serve and are a factor in the growing popularity of 4x4 vehicles on the 'school run' - because these vehicles are the only ones widely known to be able to ride over them in comfort at any speed. If this is true, it illustrates an appalling failure of government policy. In the UK, the Liberal Democrat MP Norman Baker was one of the first MPs to highlight the environmental disadvantages of "Chelsea Tractors" as these vehicles have become known. Humps are often installed to make areas around schools safer, yet 4x4 vehicles are amongst the most likely to kill a child (rather than injure it) whether in a low speed collision around school or at higher speed elsewhere. They also produce far more pollution of the atmosphere - typical mpg figures are from 11 to 23 for petrol models! Our children will have to live with the environmental consequences. Curiously, this does not seem to influence the armies of mothers in affluent areas who arrive in fleets of 4x4s to deposit their offspring at the school gates. Another characteristic of these people is that they appear to have a universal right to park on pavements and double yellow lines. I am particularly interested to receive stories of adverse effects following the introduction of humps, where they caused noise, pollution, etc, as well as of situations where those living nearby found them to be an overall benefit. One anti-hump site is run by the Association of British Drivers. As you might expect, it is rather pro-car and has recently been criticised by Friends of the Earth. The site is included for information only. www.abd.org.uk/speed_humps.htm. In the USA, Road Access for Disabled Americans (RADA) serves to highlight the pain that riding over humps can induce in those with some types of disabilities. Our own Transport Research Lab has published two interesting reports TRL 385 (Traffic calming in villages on major roads) and TRL 482 (Impacts of traffic calming measures on vehicle exhaust emissions) but neither are on the web. Apart from that I cannot find any authoritative UK guidance written by road traffic engineers who know what they are talking about and which includes discussion of how drivers behave when faced by humps of different designs. TRRL (as it used to be known) sometimes did know (but saying that, they took years to reinvent motorway crash barriers!). Since TRRL was privatised to become TRL the emphasis may have shifted from academic research and towards marketing. Is there any authoritative design guidance for road humps? Internal documents I saw years ago in Devon County Council (on another topic) were laughable. One anecdotal summary of road calming from the USA is provided on www.trafficcalming.net/index.htm and includes a few useful figures on costs. Summary papers are available at www.speedbumps.50megs.com. One argument used extensively in the USA is that speed bumps kill more people than they save by impeding emergency vehicles. There have certainly been fatalities in the UK directly attributable to road humps - see the Great Wyrley site for details. "One additional point about the speed humps in Cirencester is that they only cause discomfort if you go over them at less than 20 mph! At lower speeds they cause a violent sideways rocking motion - I have hit my head on the inside of my car roof more than once. Hence most people travel down the centre of the road in high speed games of 'chicken'. One man wrote to the local paper (Standard) to say his car exhaust had been damaged as the humps exceed height guidelines." Ineffective road humps in Cirencester. Note the wide spacing that invites high speed 'centre of road' travel. The Council have been asked to provide a breakdown of costs for the whole scheme, together with the design methodology. No reply has been received. Road humps were much in the news a decade ago. In May 2003 matters came to a head when an 'anti-hump' candidate was elected. Normally an 'independent' or single-issue councillor would be ignored by all major parties, but in this case he held the 'balance of power' enabling an unlikely alliance of Lib-Dems and Conservatives to wrest power from the Labour Group. The case is unusual in that councillors appear to have listened to residents. It is probably explained by no one party having an unassailable majority in local politics. Two major schemes were involved, in the Sinfin and Boulton/Alvaston areas of the city. Both of these consist of high density housing with many young car drivers. They are similar in character to the Manstone Estate in Sidmouth (described below). The story in brief is that around £400,000 was spent installing reinforced concrete humps and another £100,000 spent removing them. 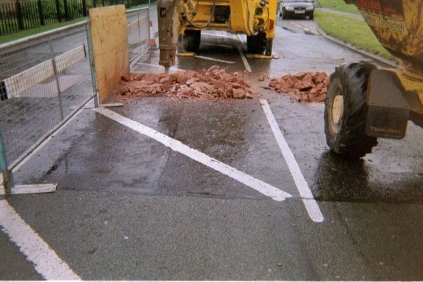 A series of photos showing how the schemes were poorly designed is given below. Admission of failure in Grampian Way, Sinfin, Derby. A series of 25 humps had been installed mostly in sets of three over a distance of 0.7 mile. 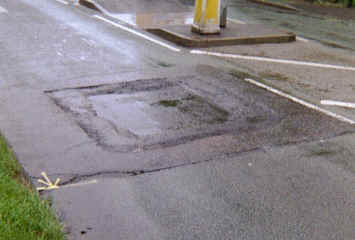 The second photo shows a 'pit' in which once sat a reinforced concrete road hump. 'Review' in council double-speak seems to mean 'Removal'. Removal of dozens of reinforced concrete humps was a major undertaking. 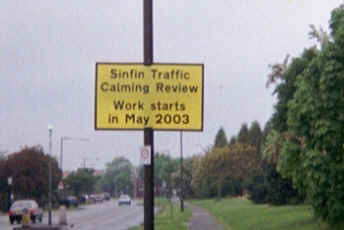 Whilst the accident rate during the period when they were in place apparently decreased, they represent a solution to traffic calming that penalised all motorists all of the time. It is a moot point whether the humps would ever have been removed if the ruling political group had had a more secure majority. A close-up view of 'triple' humps as widely used in Derby. Many motorists are tempted to drive straight over the middle (narrower) hump, thereby avoiding any significant discomfort. The proximity of parked cars encourages this practice. No thought appears to have been given to how these road alterations would affect driver behaviour. Holbrook Road, Boulton, Derby. Triple humps and their predictable consequences! The outer two are about 6' wide (1800mm) whilst the middle one is only about 5' wide (1500mm). Driving as advised by the Highway Code results in maximum discomfort. However, driving down the middle of the road gives a smooth ride, because even a small car is able to straddle the middle hump. Many drivers do just this - in both directions! 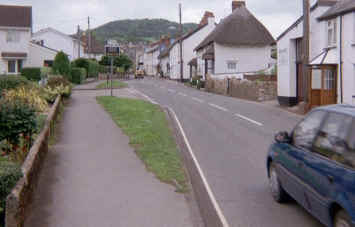 Road humps in Honiton, England. Road humps have been installed by Devon County Council in the Waterleat Avenue area of Honiton. Unfortunately, little thought seems to have been given to how drivers might behave. The consequences are much the same as already described for Derby (see above). 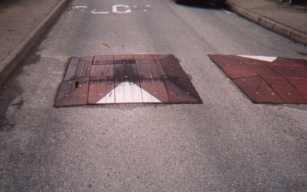 The humps are of the prefabricated rubber section type bolted to anchors set into the road. These photographs were taken on 21 June 2003. Traffic density was light and vehicle speeds were generally above 30 mph (often well above). From a selection of 40 vehicles, only 8 traversed the humps without deviating to the middle of the road to avoid them. Two sets of humps are shown. In one set the humps are separated by a single white line, in the other by a hatched area. Because the hatched area is bounded by broken white lines it is not an offence to cross into it (although you must do so with 'due care'). In no cases were there any parked cars that could have given drivers an excuse to drive in the middle of the road. Straight down the middle! 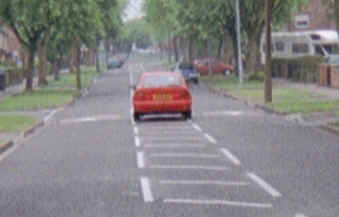 In both directions, drivers simply avoid the humps in Waterleat Ave by travelling in the middle of the road. A short distance away the road is wider. The central hatched area acts as a magnet for saloon cars and 4x4 vehicles alike. The risk of head-on collisions is increased because drivers travelling in both directions try to use the same piece of road. The potential for vehicles to swerve and mount the kerb is also increased. At least the horse(s) had a smooth ride - and travelling quite fast! The design of these humps was modified following publication of this webpage. Road humps in Sidmouth, England: experience around Manstone. 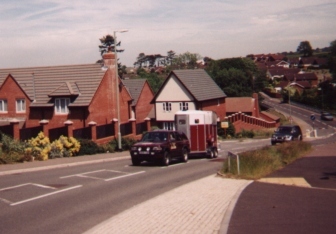 The Manstone area of Sidmouth comprises a large council estate (many houses are now privately owned) and a large adjoining private estate. Many young people live in the area - in sharp contrast to most areas of Sidmouth. The area suffers the usual problems of high density estates having inadequate provision for off-street parking. 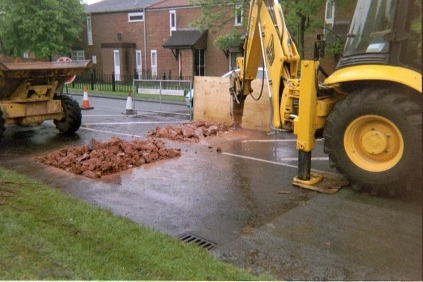 Speed humps were installed in c. 2002 as a part of 'improvements' connected with development of a new Lidl supermarket. Again, these were of the prefabricated rubber section type. Being of similar dimensions to those described above in Honiton and Derby they are 'severe' in their treatment of car suspension systems. However, in this scheme they are positioned so that even when a car is travelling in the middle of the road at more than about 5 mph, occupants cannot avoid a severe jolt. Very large vehicles (fire engines etc) can straddle the humps and pass over at speed, except when parked cars make diversions necessary - and in this area that is most of the time! 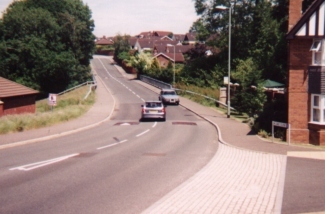 Some types of cars can also travel over these humps at high speed and suffer little deflection. the same humps (on a slope) are also used by local youngsters to perform antics with cars, including 'lift off'. The slope of the road facilitates all four wheels of the vehicle leaving the ground if the approach speed is high enough. Becoming airborne is apparently considered a challenge in the locality. Road humps in Manstone, Sidmouth. The narrow spacing precludes unencumbered 'centre of road' travel and the slope of the road facilitates cars becoming airborne. Devon County Council have been asked to provide a breakdown of costs for the scheme, together with the design methodology. Typically, no reply has been received. 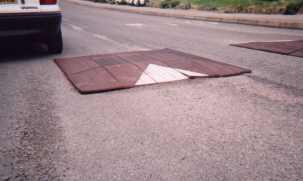 It is understood that these prefabricated humps are expensive compared with using tarmacadam. 'Lifting' of the rubber prefabricated sections is clearly visible, the result of gravel becoming lodged under the forward edge down the slope. One of the Manstone humps is higher than all the others - witness all the score marks. Complaints have been made about damage to car exhaust systems. Devon County Council has taken no action to rectify what is an obvious problem. 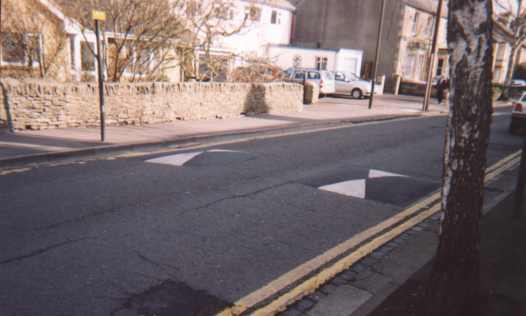 In November 2007, the road humps in Manstone became front page local news because (after consultation with the SeeRed author) they were included in a list of the ten worst sets of road humps in the UK. This generated a flurry of further local publicity in December with councillors preening their egos by pretending that they knew all along that these humps were unsatisfactory and should be replaced by 'tabletop' humps. Not surprisingly, seeing which way the wind was blowing, Councillor 'lunatic' Hughes (under whose expert guidance the Manstone humps were first installed) was then firmly of the opinion that they should go! Another local 'high profile' local councillor (Graham Liverton) who has never had much time for Hughes is (predictably) standing on his soapbox and criticising the original scheme. And all this charade of public administration is being undertaken within the newly revamped offices of Sidmouth Town Council where £200,000 of public money was spent updating a hugely energy inefficient old building that arguably should have been knocked down an an energy efficient new building constructed in its place - and probably for less money. The opportunity should also have been taken to trim Sidmouth Town Council down to size. But on with the story of the humps! 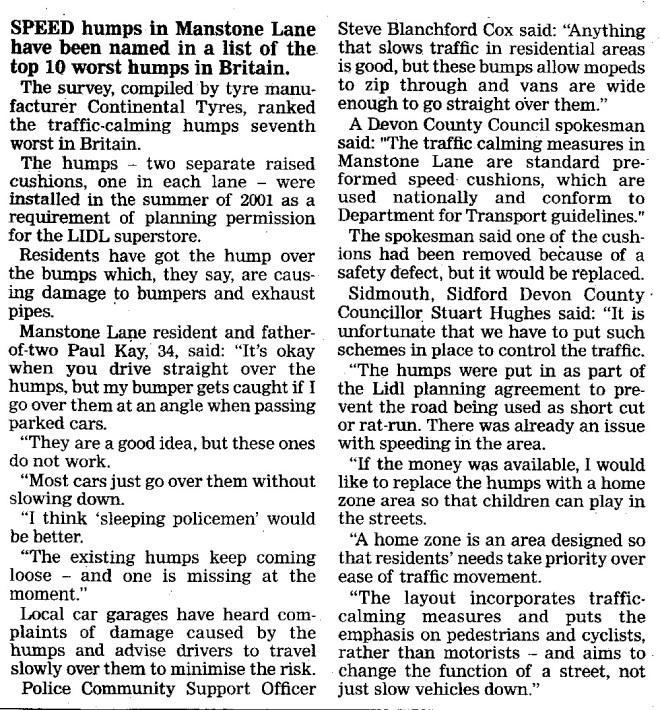 As reported in the local Sidmouth Herald in late November 2007, the Manstone humps were reported to be amongst the worst in the UK. It would be amusing if it were not all so expensive in terms of both public money and in damage to private vehicles. 1. abandonment of the Sidford relief road (which was first proposed in the 1930s but was not seriously supported over the last 20 years because of the house building adjacent to its proposed route and changed environmental priorities). 2. the increase in traffic congestion in the centre of Sidford following installation of the traffic signals (this has caused some local drivers to use alternative routes to avoid the much longer queues at the main cross roads). Taking Sidford as a whole, the traffic problems on the roads that now have humps remain trivial. The vast bulk of traffic is along the A3052 and this road also suffers from 98% or more of the speeding within the village. There is also an urgent need to provide proper pavements (sidewalks to you guys and gals in the USA). Needless to say, money has been squandered on humps on minor roads that will achieve little if anything to improve road safety. 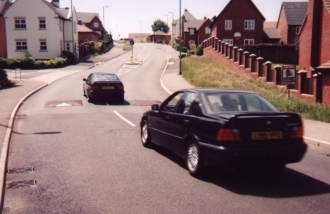 They cause inconvenience to many elderly drivers and yet the most important issue of pedestrian safety along the main A3052 is unresolved as of late 2007 - five years after Sidmouth started spending money on humps. Do other County Councils operate in this manner? Is it time we got rid of County Councils and had traffic planning and road maintenance supervised by experts whose minds are unpolluted by local politics, party political infighting and petty power struggles? The famous Sidford Wild Garden. A 20 mph limit throughout the village that is already so flouted that it may serve primarily to bring traffic management as a whole into disrepute. About 4 years ago, the police once set up a speed trap, reminded a few motorists of the new limit and have not been seen since. They probably realise as well as other people how absurd the 20 mph limit is on a main A road where the 'natural' and quite safe speed under typical conditions is around 30 mph. Elsewhere on the same A3052 road, and within the 30 mph zone of Sidford, traffic speeds are regularly in excess of 50 mph. And why did the issue of the humps ever arise? Because the traffic signals so reduced the junction capacity that extensive queues build up during busy periods and many local drivers (including me) regularly used the side roads as a restful alternative. These are wide, with good visibility and on a bus route. A little traffic is to be expected and few people speed because of the number of parked cars. The 20 mph limit throughout the village has never been enforced with any enthusiasm. Have you tried driving at 20 mph for half a mile during hours when there is virtually no other traffic on the road and when 30 or even 35 mph would be quite safe? If you did it in most towns the police would book you for obstructing the highway. The only really noticeable effect was vehicles travelling at 20 mph for the first few hours of the system's operation, until they too decided it was just ridiculous. A few foreign registered vehicles still dutifully obey the 20 mph limit, their occupants having often a look of bemused disbelief. Local drivers gave up taking any notice years ago. Fast forward a decade or more to September 2016 and Devon County Council installed a 'black box' monitoring device along side the A3052 within the 20mph zone and opposite the junction with Packhorse Close. Despite looking innocuous it packed enough technology to measure vehicle speeds and record how many traffic movements there were each hour, and the speed of vehicles. Whether the data will ever be used to effect improvements in speed enforcement is a moot point. Only 'average speed' cameras seem to have any effect - these certainly modify driver behaviour on motorways. Speed Visor - experience in Sidford. Later, in May 2003, a single 'advisory' flashing sign (trade name "SpeedVISOR" and manufactured by PAT GmBH) was installed to warn drivers when they were exceeding the 20 mph limit. This had a marked effect initially on some car drivers and no effect on many van drivers. During the evening rush hour and after 8 pm the sign flashes a warning at almost every vehicle. The sign can log the speed, date and time of passing vehicles so enabling effectiveness to be demonstrated. Some experience in the UK has already been published by Cornwall County Council. (the link has been deleted!) and other details are available from the company. (also now deleted!!) The batteries had to be changed about every week. 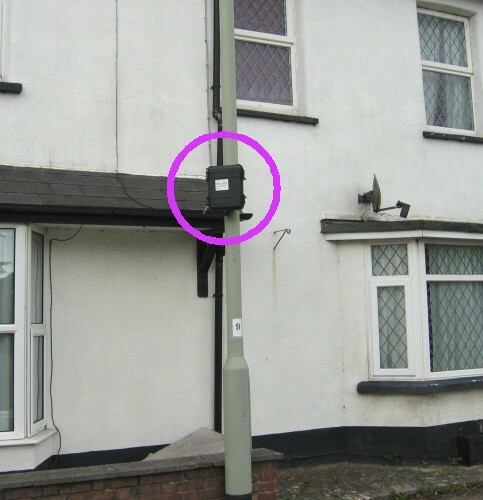 Because the sign was in use so much it was considered for connection to mains power in Sept 2003. (information from DCC). 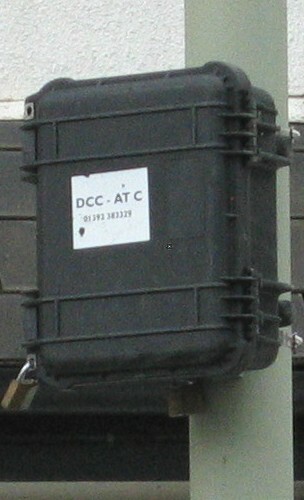 However as of 2006 batteries were still being changed regularly by contractors and in 2007 the sign was replaced with a less effective solar powered version. Research has claimed that "almost all drivers travelling in excess of the speed limit will decelerate to some extent once reminded of their speed". Local experience bears this out to some extent, but in the early years most drivers approached the sign at a 'reasonable' 30 mph (or thereabouts) and did not slow down. Most now ignore it completely. Other trials have used similar equipment to display not the speed limit but actual vehicle speed - these may be more effective. One problem noticed occasionally was that drivers obeying the speed limit were encouraged to slow down to less than 20 mph because the sign became activated by a vehicle some distance away approaching at well over the speed limit. A few 'shunt' collisions amongst the line of slow moving vehicles near the sign were narrowly avoided. A speeding vehicle approaches the old type of electronic 20 mph sign in Sidford. The sign flashes a very noticeable reminder of the speed limit. This one small sign initially had a profound effect on the behaviour of many drivers and no effect at all on the most dangerous speedsters, especially those travelling in the opposite direction! Unlike road humps, these signs do not punish all drivers for the sins of the few. High speed travel of emergency vehicles is unimpeded and there is little increase in either noise or pollution. One impressive feature of the sign is its detection distance. Cost is apparently about £3000 per unit. The unit was later vandalised, then replaced, then replaced with a much less effective solar powered version. As of November 2006, there have still been no prosecutions. Devon County Council (DCC) have lived up to their reputation for inveterate incompetence and dishonesty by claiming that the scheme has been a huge success and that 80% of vehicle approach speeds are now "at or close to the 20 mph limit". This is absolute rubbish in respect of the conditions in times of 'free traffic flow' when drivers can choose their speed. Approach speeds, and indeed speeds through the village as a whole, are closer to 30 to 40 mph with a few 'boy racers' of both sexes travelling at probably well over 50 mph. 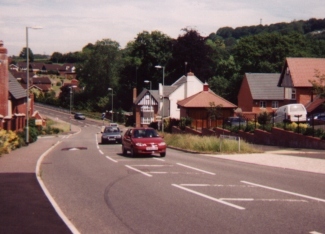 Nevertheless, if you were an incompetent and/or dishonest bureaucrat you could include in the analysis of vehicle speeds all those (many) cars and lorries that crawl through the village in traffic jams that have become a feature of the main A3052 since the Sidford traffic lights were installed. For example, if 80% of summer traffic is constrained to crawl along at 10 mph or less because it is stuck in a queue and if under 'free flow' conditions average speeds are 40 mph then of course the average is less than 20 mph. And if you were as incompetent as Councillor Stuart 'lunatic' Hughes you would swallow the DCC analysis in a single gulp. 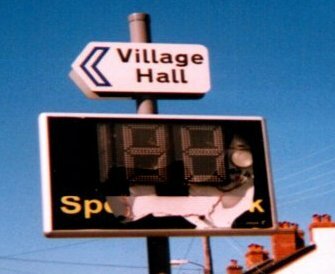 The Sidford Speed Check sign was vandalised in September 2004 but was soon repaired or replaced. A less noticeable and less effective solar powered version has now been installed. Some types of these devices do not log vehicle numbers but they can record vehicle approach and/or passing speeds. Both units were removed some years later, never to be replaced. The Village Hall sign was however replaced with one that more correctly stated 'Social Hall'! This produced a vast improvement in village life! Notwithstanding the limited success of the sign shown above, a proven solution appears to be available to the problem of high volume fast traffic on main roads through villages. However, it is widely used in Spain and may have been invented there. As a consequence, it will not, can not, MUST NOT EVER be used in the UK. We can't have foreigners showing English County Councils how to do things can we? Another reason that such a successful solution has not been adopted in the UK has been put forward in the press: use of speed cameras in the UK generates a huge revenue stream for the 'safety partnerships' involved, and large salaries and perks are included. More recently this scheme was abandoned and the financial rewards to councils disappeared - and so many or indeed most cameras (each costing maybe £20,000) fell in to disuse. Speed sensitive traffic lights work so well (because they are so visible and because red lights are so widely respected) that far less revenue would be generated. The essential desirable characteristic of 'the Spanish solution' is that drivers obeying the speed limit are not inconvenienced at all whilst those that 'run' a red light commit an easily prosecuted offence. With both these 'electronic' types of speed control, drivers who obey the speed limit suffer no discomfort. This is more than can be said for road humps, some types of which can be driven over in greater comfort at higher speeds! Finally, a useful numbers of links to government departments, charities and other bodies concerned with road safety is available. Road humps and other problems in Bromley are discussed on an extensive site operated by the Bromley Borough Roads Action Group. For further examples of road humps and local protests, please see links on other websites, including one based in Nottingham.